Advertising may be blocked by your browser security settings. Please, if blocked; Consider unblocking - Thank you. 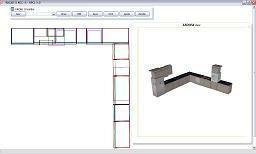 KitCAD i3 rX is a freeware interior kitchen design computer software program package made for public use without any long downloads, or membership requirement. Click the Start button to Run KitCAD i3 rX now from the Kitchen Pages Web Server; Works accross Operating Systems from within modern Website Browsers. Any Operating system with a supporting HTML5 Web Browser that has WebGL enabled and working can be used to access KitCAD i3 rX online - or anytime offline after accessing the online version. Web Browser clients with Dial-up access to the Internet or those using a legacy HTML 4 modern Web Browser can Start KitCAD i3 in place of using the latest release. Web Browser clients with the latest modern Web Browser standards supporting HTML5 can Start KitCAD i3 rX online or download the installer files below. KitCAD i3 rX includes help documents and information links for both Novice or Advanced users. Create, Edit, or Draft shared content; Free downloads for joinery, cabinet makers, and the public. Note: Read Instructions before any use; Windows XP(sp3) users will need to select 'Custom Setup' and install 'dcef v1.0'.